The last couple of days have been a lambing explosion! First, Islandfleece Freya lambed on Thursday. I didn't get a chance to grab the pictures and was planning on doing that on Friday. Here's a picture of Freya with her two lambs. She was bred to SheltrgPines Gulliver. 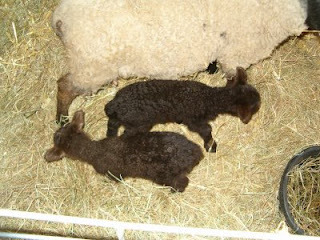 This is Freya's chocolatey ram lamb. He was the second one to be born. 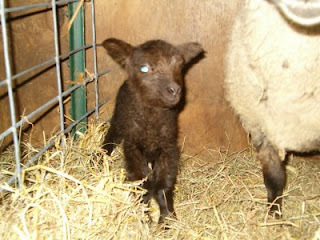 This is Freya's black ewe lamb. She was the first one to arrive. On Friday, I planned on getting shots of the new lambs and posting here on the blog, but when I got home Friday night, Tim came into the house saying that there were lambs everywhere. I quickly rushed out to help him to find that Contented Rafn had a black ewe lamb on the ground and that LaughingRiver Rosemary had just birthed a lamb. Below is a picture of Contented Rafn. She's a black who has some heavy iset (white fibers mixed in the fleece - think salt and pepper hair). Excuse the sideways picture of her. She was also bred to SheltrgPines Gulliver. 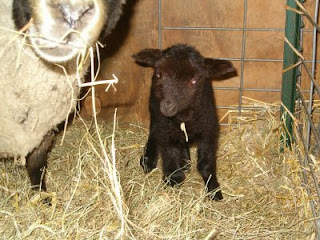 Rafn gave us this really pretty black ewe lamb. 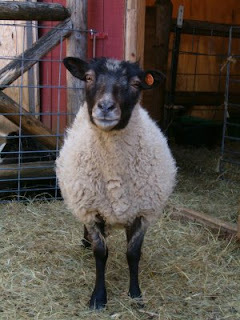 LaughingRiver Rosmary, another black ewe, was bred to Contented Balder. He's not registered yet - dam is Sabbath Farm Celebrian and sire is PaintedKnoll Zweiback, but will be as he is looking excellent conformation wise and his horns are nice and wide. Rosemary is very protective of her lamb. 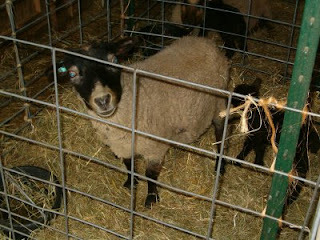 Here's a shot of Rosemary's black ewe lamb. Tim thought that the black lamb of Rafn's was Rosemary's until he picked up the lamb only to have Rafn baaing and following after her. Silly Tim, Rafn knew it was her lamb! 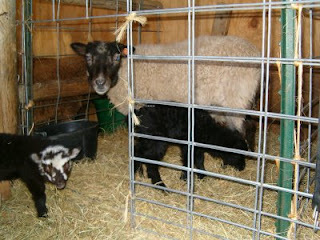 After we got the lambs and moms sorted out, we placed them in their lambing jugs to bond with baby. Not to be an exaggeration of baby explosion, we noticed that Viveka, who as one friend kindly put it, "She's as big as a table! ", was wandering away from the other ewes. Sure enough, she was not going to be outdone by two younger ewes! Islandfleece Viveka promptly (okay not so promptly - about an hour or so after the others were settled into their jugs) gave birth. She was bred to SheltrgPines Uber. 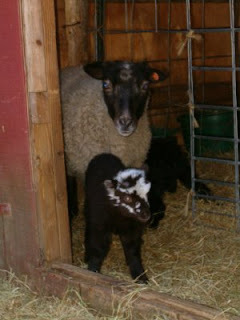 Their pairing gave us two katmoget ram lambs. Here you can see her with the second ram lamb behind her. We had run out of lambing jugs, so constructed a jug around where she lambed using hog panels. God bless hog panels. 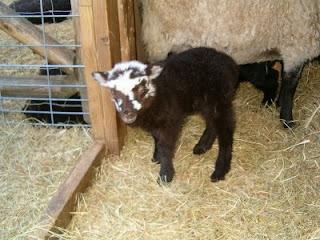 Here's a shot of the first ram lamb born. All that birthing in two days time has me wiped. I'm so tired, you would have thought I gave birth to 6 lambs! I just looked over my paperwork when we had breeding groups together and see that I did catch when Bach mounted Celebrian. Based on that date, looks like more will be on the ground by Monday. Stay tuned. I'm excited to see what Bach is going to give us. For those keeping track, we've had 7 ewes give birth to 12 lambs. We bred 11 so, we've got 4 more to go. The ewe to ram ratio is currently tied at 1:1 (6 ewes and 6 rams). Contented Helle is one of the first lambs that have been born on our farm. This is her first year to lamb for us. Last year we put her in with one ram and he turned out to be a wife beater (he was very yummy - no wife beaters on this farm). She then was popped into another breeding group, but I think she was still way too wary of the ram to settle. This year, she was given to SheltrgPines Gulliver and settled. 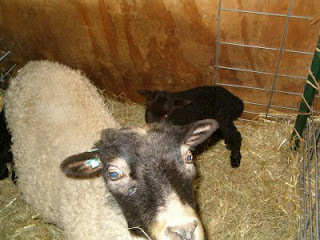 On Monday, April 13th, she gave us two ram lambs. The chocolatey ram lamb with the splashy looking face was the first to be born. He's going to have some really big horns. He already has some buds pushing out of his head. I'm thinking that he's going to be a musket (oatmeal) colored lamb as he's already looking kind of light around the neck when I part the wool. The second lamb (who still had birthing fluid on his hip when I found them) is a ram lamb who at this point is looking very black. 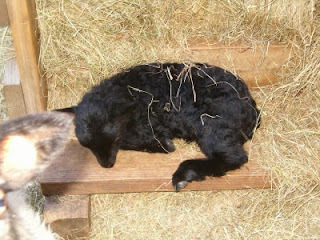 Here he's lying down on the step up to the hay feeder. You can see a real close up of mommy's ear and a portion of her eye. She was looking for some cookies. Here's a shot of mom and the boys. One taking a snack while the other looks out the doorway. Mulan finally came through and gave me some lambs. I've been watching her get larger and larger and her bag has been quite full for a while, so I figured she was going to be the first to go. They always like to keep me guessing. Underhill Mulan was bred to Contented Balder, an as yet unregistered offpspring from Sabbath Farm Celebrian and PaintedKnoll Zwieback. Mulan gave me one ewe lamb and one ram lamb. So far they're both moority looking. Mulan is a good, protective mommy. Excuse me, is that camera going to hurt my baby? No? Okay, progress with the pictures. The little boy is a nice chocolately moorit. His horn leather is very small, so he may just have scurs. Mulan carries the half-poll gene. The girl has a few white hairs on her head and there's some light fibers by her ears, so she may become a musket. Islandfleece Rakel just surprised me this early evening with twins. She was bred to Sheltrgpines Uber. Both are girls. One girl is a katmoget with a nice splash of white on her head. A krunet katmoget. She weighed 6 pounds. The second girl is a nice chocolatey moorit. She weighed in at 5.8 pounds. I think they all make a nice family. I'm so happy that lambing for 2009 started off on a good foot. More chickens you say? Well, yes. We needed to get more chickens as our supply wasn't keeping up with the demand. Since I'll be at the Windsor Farmer's Market now, I figured a dozen or two wasn't going to cut it. Enter the Golden Comets, a cross between a Rhode Island Red and a White Leghorn. They're supposed to be good layers of brown eggs. I found out that my feed store carries 16 week old pullets to purchase. We ordered 12 of them and I went to pick them up yesterday morning. I'm hoping that I got the chicken that laid an egg in the crate while they were waiting to be offloaded. Wouldn't that be lucky? They're currently residing in the Boober's kennel. Okay, Boober hasn't resided there since we put breeding groups together (hence the hay chaff on the ground). Tim and I worked on a small pen they could go into for the evening (nothing more than a modified breeding hut) with a roost and guess what they chose to sleep in last night? That's right, Boo's dog house! All 13 of them (including Limpy the second banana Barred Holland roo - thanks mom for the phrase). The girls have taken to Limpy, including grooming him. I've not seen my other chickens do this before. The only time they dissed him was when I let the other chickens out and they got a good look at the Partridge Chantecler roo. According to mom, they ran over to the fence and left Limpy with a cold shoulder. Here's a shot of him. He is a pretty handsome devil if I do say so myself. 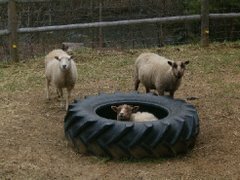 Here's a video of the girls that I took about one week ago when Tim was cleaning out their pen in anticipation of lambing. They can go any day now.